In this post, you’re going to learn how to make an authentic Thai cashew chicken recipe, that has amazing flavor, and that’s surprisingly quick and easy to make. 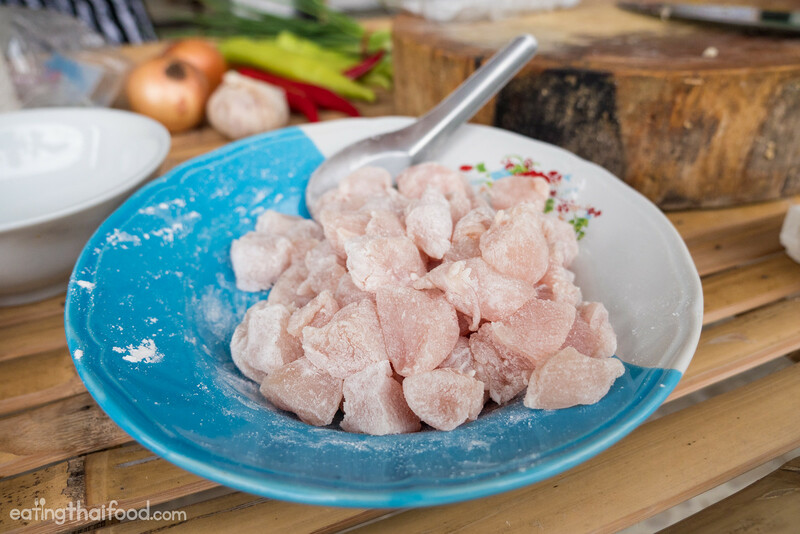 It’s a famous dish in Thailand, and now you can make it at home! This Thai cashew chicken recipe is from my friend Hanuman and featured in his 49 Classic Thai Stir Fry Dishes recipe ebook. This is the way I like my cashew chicken! Before we get into this recipe, I just have to quickly share something with you. I’m a huge fan of Thai cashew chicken, but in Thailand I very rarely order it. Because it’s one of those dishes that’s very hit or miss. Oftentimes if you order it at any random street food stall in Thailand, it comes as a few pieces of chicken and cashew nuts, in a lumpy sweet and sour sauce. But the version I love, which you’ll occasionally find in Thailand at nighttime Thai Chinese stir fry restaurants, which is crunchy, and salty, and full of caramelized onions and crispy cashews, is the version I really love. This recipe will show you the authentic latter version, no shortcuts, but still very easy and quick to make, with ingredients you can probably find at your local supermarket. One of the great things about this Thai cashew chicken recipe is that the ingredients are pretty basic, and you should be able to find just about everything you need any at local supermarket. Again, this recipe is directly from 49 Classic Thai Stir Fry Dishes which is an amazing recipe book. 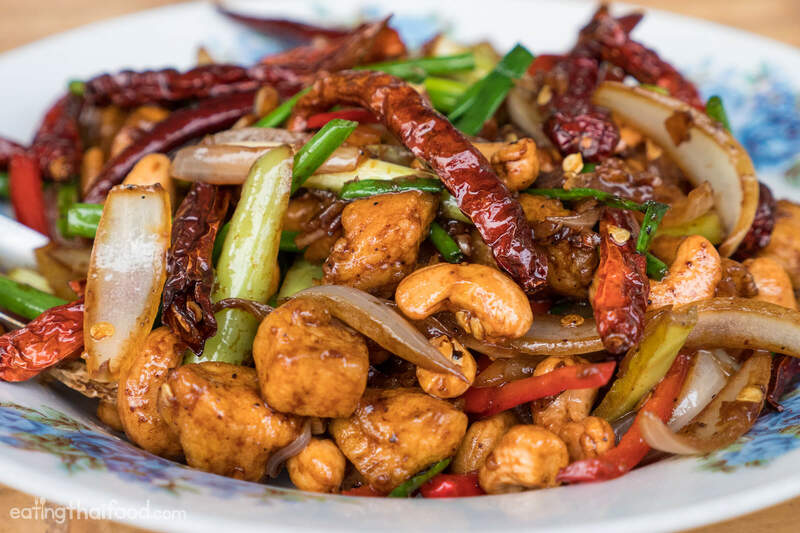 Once you have all the ingredients prepared, all you have to do is quickly deep fry the chicken, cashew nuts, and dry chilies, set them all aside separately, and then stir fry the entire mixture together. But getting the steps right will ensure you have the best tasting Thai cashew chicken. If you want to get straight to the directions, you can scroll down to the recipe box below. Otherwise keep reading for more photos and personal details. 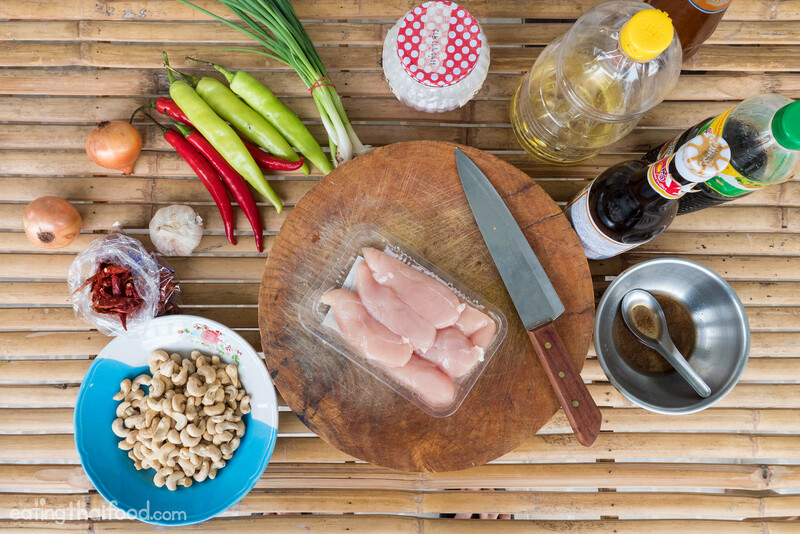 The first step in this Thai cashew chicken recipe is to mix the sauce ingredients. Put everything in a bowl, stir it up, and leave it aside for later. For the sauce, it’s up to you how much sugar you want to add, I just added in a tiny pinch and it was perfect for me. Dice up the chicken into bite sized pieces, and mix it with a spoon of flour. Make sure all the chicken is evenly coated, and not caked on anywhere. In order to use the same oil to fry the cashew nuts, dry chilies, and chicken, yet all separately, I first fried the raw cashew nuts. 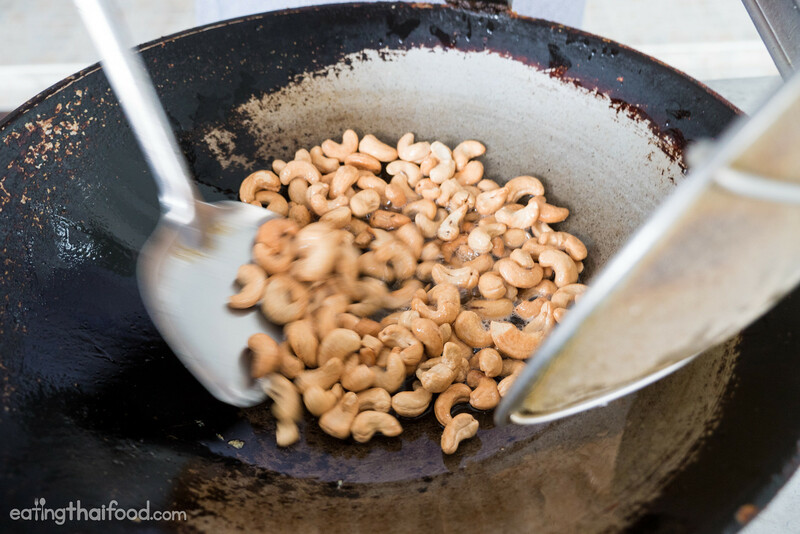 Add about 1/3 of a cup of oil (I used sunflower oil) to a wok or pan on a medium heat, and fry the cashews until they turn golden brown. This will take shorter than you think, it took me only about 1 minute. And you have to be careful, they are kind of like French fries, if you see them turning golden you need to take them out of the oil immediately, or they will burn fast. Drain the cashew nuts and set them aside. The Thai dry chilies are also very quick to deep fry (more like shallow fry). 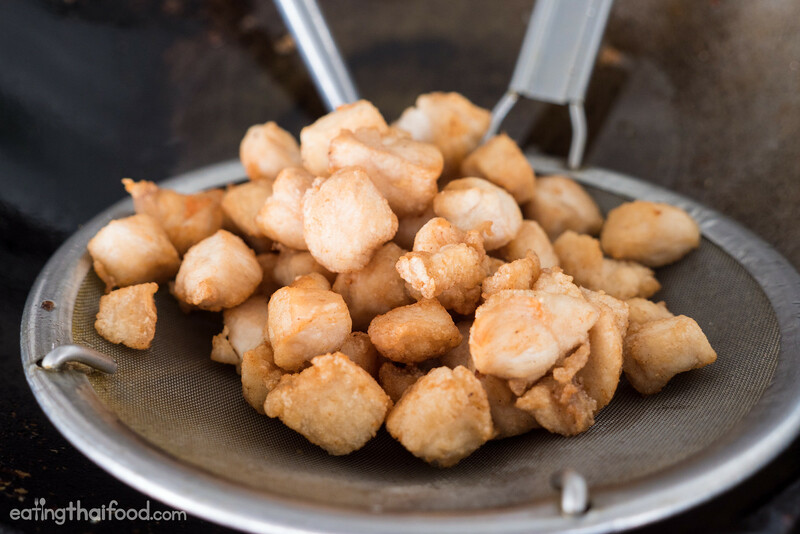 You want to toss them in the hot oil and fry them for only about a minute, stirring continually. You’ll see them turn crispy, and make sure you watch them close and take them out of the oil before they burn. Next, fry the chicken cubes. I fried the chicken for about 5 minutes or so, until they turned nice and golden crispy on the outside. Then drain the chicken and set it aside. 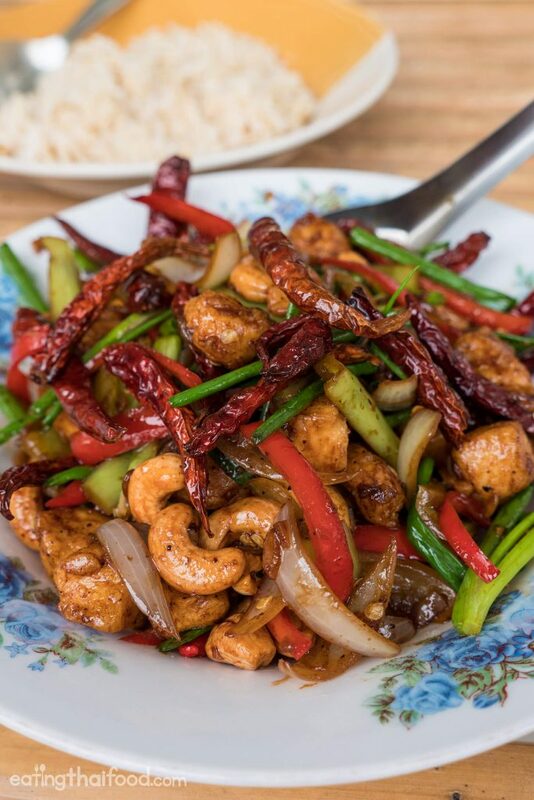 At this stage of making this Thai cashew chicken recipe, you should have all your vegetables chopped up and ready to go, the chicken, cashew nuts, dry fried chilies, and sauce mixture. Now you’re ready to stir fry everything together. First, add about 1/2 tbsp. of oil to your wok or frying pan and wait for it to heat up. Then toss in your garlic, stir fry for about 10 seconds, and then add in the onions. Stir fry for a few seconds until the onions become translucent. Then add in the fresh green and red chilies. 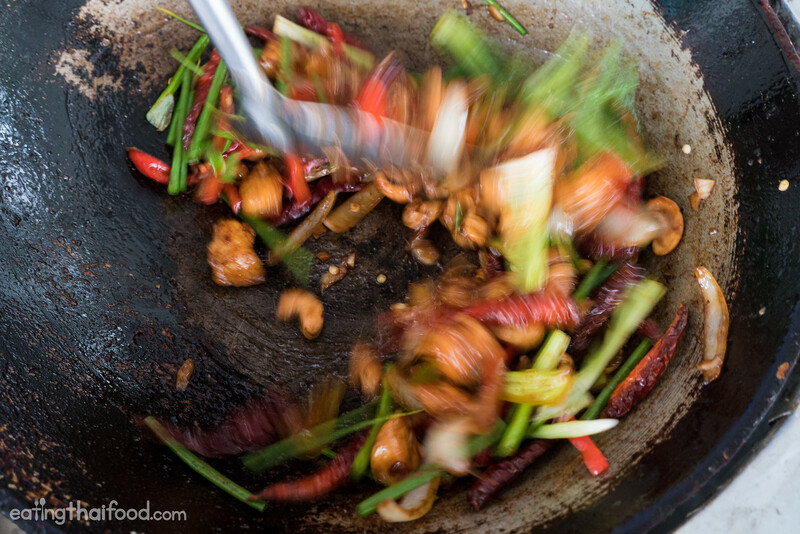 At this stage, you can add in a few sprinkles of water if your wok is getting dry, but don’t add too much water. Grab you seasoning sauce mixture, and add it to the wok. 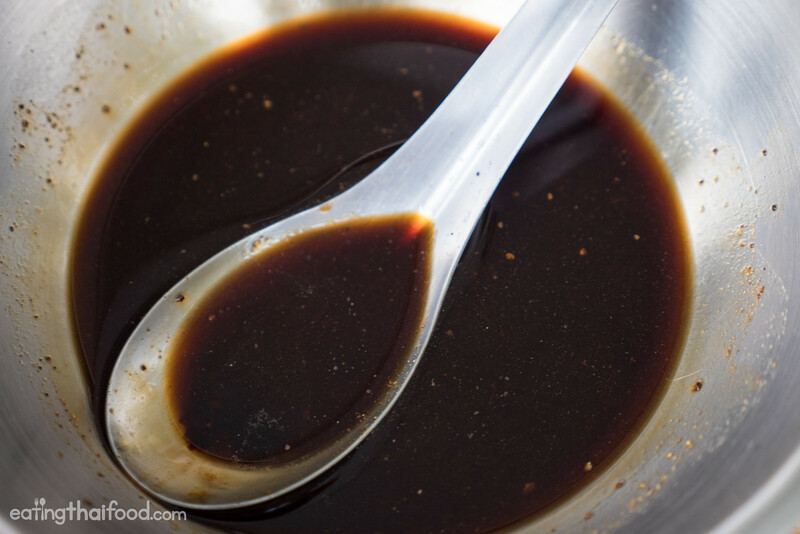 Keep stir frying and you’ll see that the sauce quickly begins to thicken and get sticky from the oyster sauce and dark sweet soy sauce. Once the sauce is thick and sticky, add in the chicken, cashew nuts, and dried chilies, and gently stir fry, making sure all the sauce evenly coats all ingredients. You don’t need to stir fry for very long, just a couple minutes max. If it gets too dry, you can add a sprinkle of water. Final step is to add the green onions, and give your cashew chicken a few quick stirs, and then turn off the heat. The green onions will still cook a little from the heat of the other ingredients and you want them to remain crisp and fragrant. That’s all the steps, you’re now ready to eat an amazing version of Thai cashew chicken, and it’s so quick and easy to make! This is a Thai recipe from my friend Hanuman, featured in 49 Classic Thai Stir Fry Dishes recipe ebook. In this Thai cashew chicken recipe, you'll learn how to make a quick and easy version of this amazing dish. First mix up all the seasoning sauce ingredients in a small bowl and set aside. 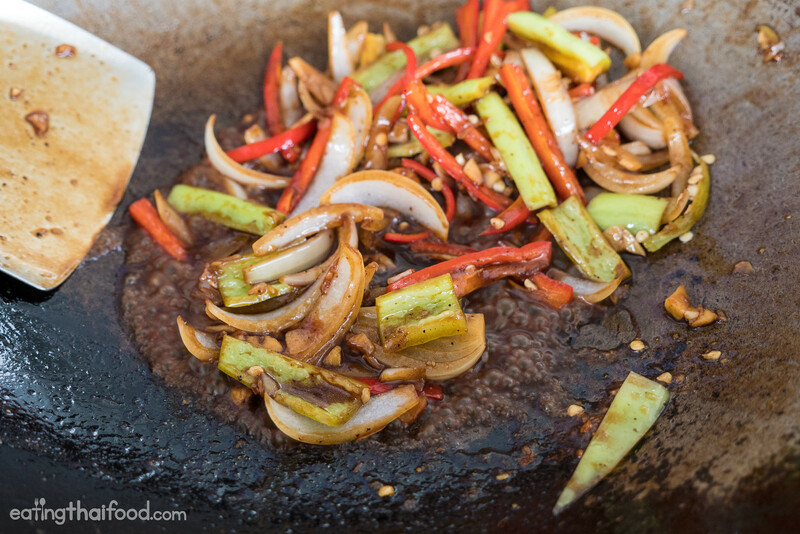 Add about ⅓ cup of oil to a wok or frying pan, and wait until it heats up. Fry the raw cashew nuts for about 1 minute in the hot oil until golden brown, then drain, and set aside. 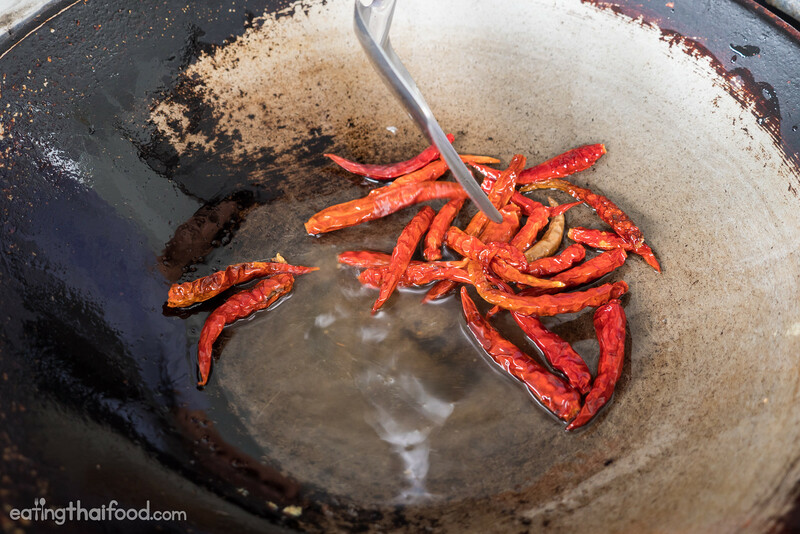 In the same oil, fry the Thai dry chilies for about 1 minutes until crispy, drain, and set aside. Dice the chicken, and mix with flour, to evenly coat it. Then again, fry in the oil for about 5 minutes until golden and crispy. Drain and set aside on a plate. 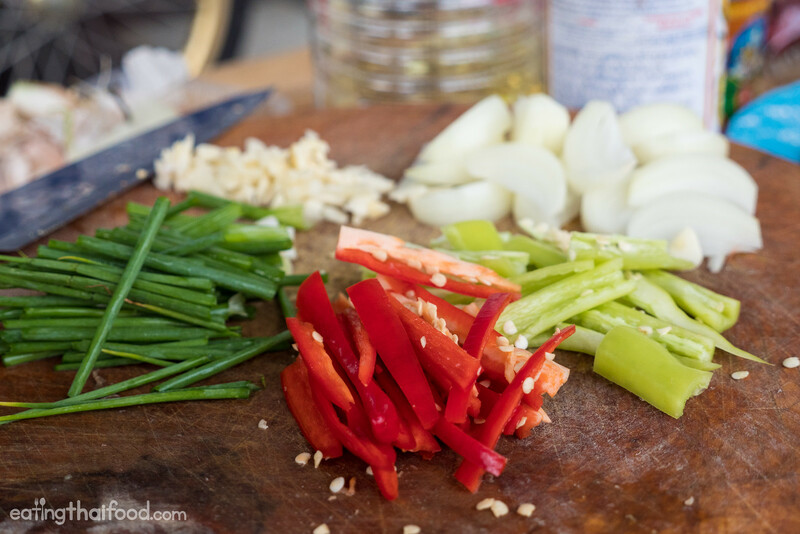 Make sure you have all your garlic, onions, and fresh chilies, cut and ready. Add ½ tbsp. of oil to a wok or frying pan on medium high heat. Stir fry the garlic for a few seconds, then add the onions and stir fry until translucent. Then add the red and green chilies and stir fry for a minute or so. You can sprinkle a few drips of water in the wok if it gets dry. Add the seasoning sauce mixture, and stir fry until the sauce thickens and become sticky. 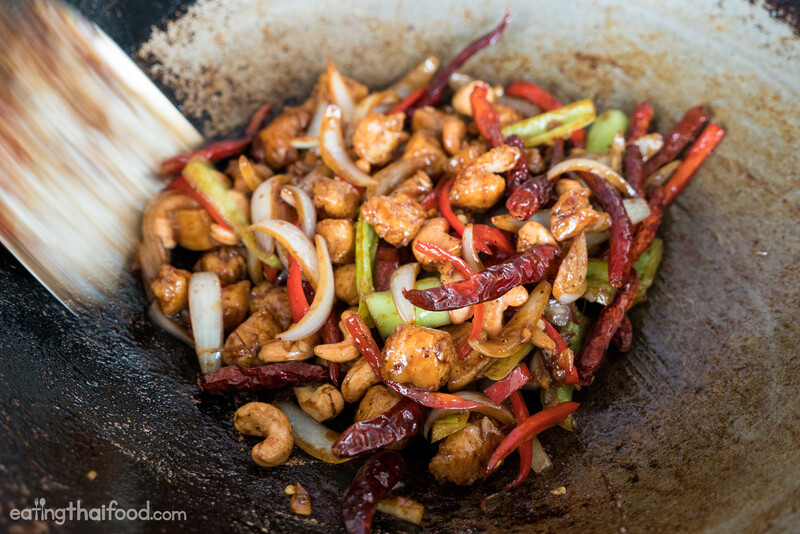 Add the chicken, cashew nuts, and dry chilies, and stir fry until everything is coated in the sticky sauce. You can add a few sprinkles of water if it gets too dry. Last step is to add the green onions, stir fry for only a few seconds, then turn off the heat. 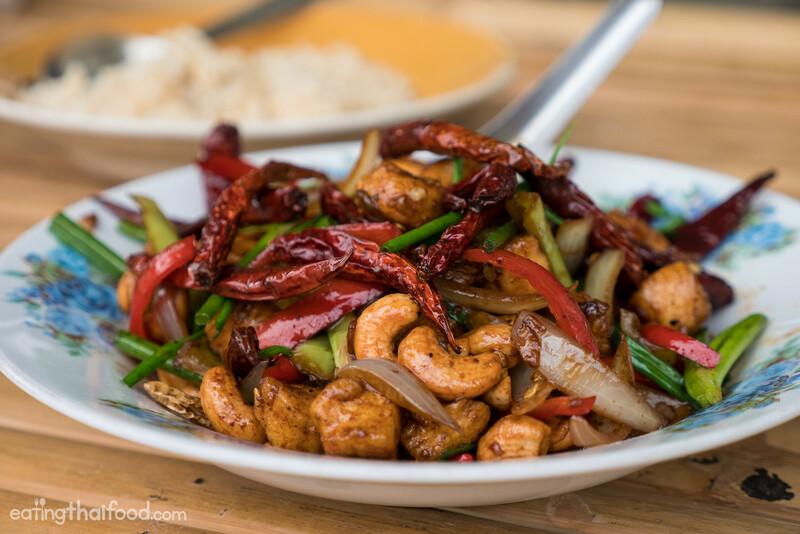 The aroma of those dry fried chilies, the caramelized onions, and those crispy cashew nuts will have your mouth watering at this stage. 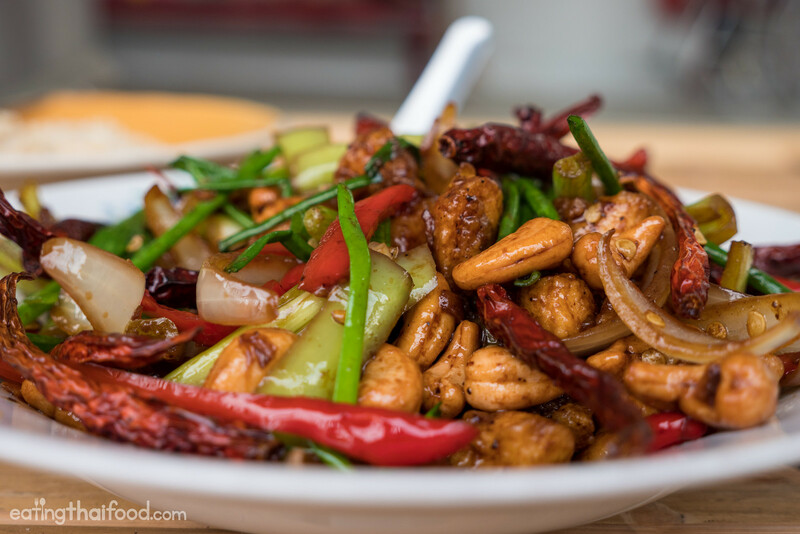 The chicken will be crispy, but covered in that glazed salty and sweet sauce, the cashew nuts will be crunchy and creamy, and the mixture of vegetables and dried chilies will give it so much flavor. Just like when you cook many other Thai recipes, make sure you have some steamed rice ready to go so you can eat while it’s hot and fresh. It’s so good, you’ll love it! This is an easy to make Thai cashew chicken recipe, yet the flavors will impress you and whoever is eating with you. Make sure you follow the steps exactly, so you make sure everything is crunchy and crispy, yet all mingled together perfectly. 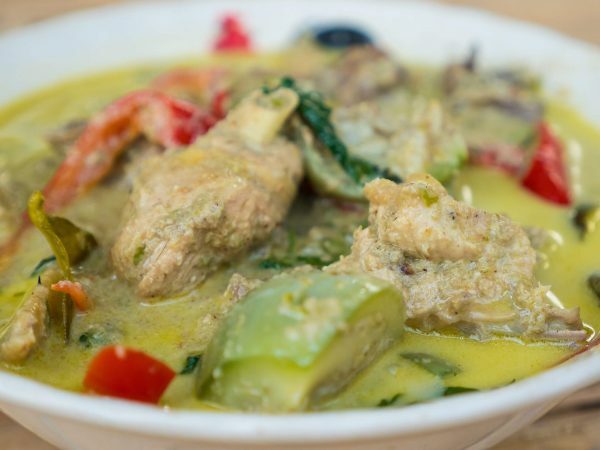 If you love Thai chicken with cashew nuts, this is a recipe you should try today! Again, thank you to my friend Hanuman for sharing this recipe with me. 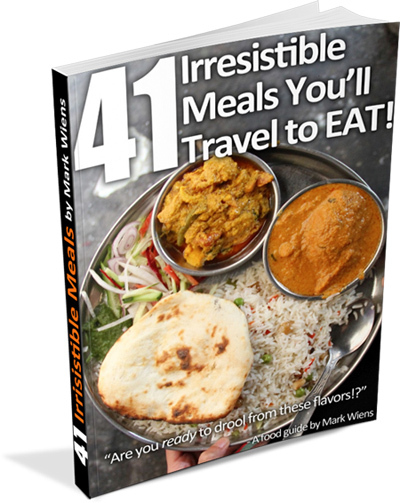 Check out his 49 Classic Thai Stir Fry Dishes recipe ebook for more authentic Thai stir fry dishes that you can easily make at home. This was such a good recipe however the level of hot chillis was a too much!! We tried to use the chillis in the recipe but ended up just using what the local shop had an wow too much!!! We had to fish out the chillis but lovely fish even without them! Hey, quick question. I’ve seen this a couple of times but why do you fry dry chilies instead of fresh in the beginning? Mark…. hi! Man I can’t wait to get the ingredients to make this. Your pics inspire me. True too how this is a meal that so many Thais mess up. But even messed up it ain’t bad! Hey Peter, awesome to hear from you. Hope it turns out well! This was amazing! I was a little worried about all the frying but it cooked up quickly and was restaurant quality . Make extra coz it tastes even better as leftovers. I doubled the sauce recipe because we love lots of sauce. This was sooooo good. Yum! Glad you enjoyed it Marissa! This is amazing, wonderful flavor and so easy to make! Yum yum! I added some extra veggies and fresh ginger to the chicken… finger licking good. I applaud the writer of this recipe and encourage anyone on this website to make this! Thank you for the recipe! i tried it today, and it was quite good! This recipe is phenomenal. Thank you for introducing me and my husband to a new-to-us dish. We can’t stop making it! Thank you for this great recipe, Mark. I made it last night, and it came out great. Really appreciate the details about cooking times. I’ve eaten cashew chicken before, but this is the best! I cooked this today without the dried chillies, it still turned out much better than i expected. thanks for the recipe! This looks really good, Is it as spicy as it looks? That’s a lot peppers. Tried and tasted, and it was awsome!! Going to make this again and again, Thank you so much for a great recipe! It sounds excellent dish…certainly going to make it..
Hey Mark, just made this recipe today, and it’s delicious!!! Thanks for the good recipes and the great entertainment, keep it up!!! Tried to replicate this, and it did NOT turn out like the pictures, haha… amazing food, maybe the best in Asia. I am a big Cashew chicken fan. I usually go to a place close to my house in Pittsburgh. It’s a Combodian place and carries Cashew Chicken. Thanks for the recipe. I will try to cook it soon. Such a mesmerizing and delicious recipe! keep sharing!! Is this recipe too spice? I lthink this recipe seems amazing, but I’ve never tried this dish before. Could a toddler handle the spiceness? My kid doesn’t eat spicy, and I’m afraid it won’t taste good without the chili peppers, will it? Ecstatic finding the recipe here! Didn’t expect the ingredients would be quite simple, usually too many ingredients turn me off (lazy!). Definitely will give it a try, thanks Mark! Okay, this is an amazing food ever! I used to cook this for the exchange student from the States whom I hosted her for a year, she really loves it :D She said that the taste is good, not too spicy, not too sweet, and not too salty. I think everyone should try it. 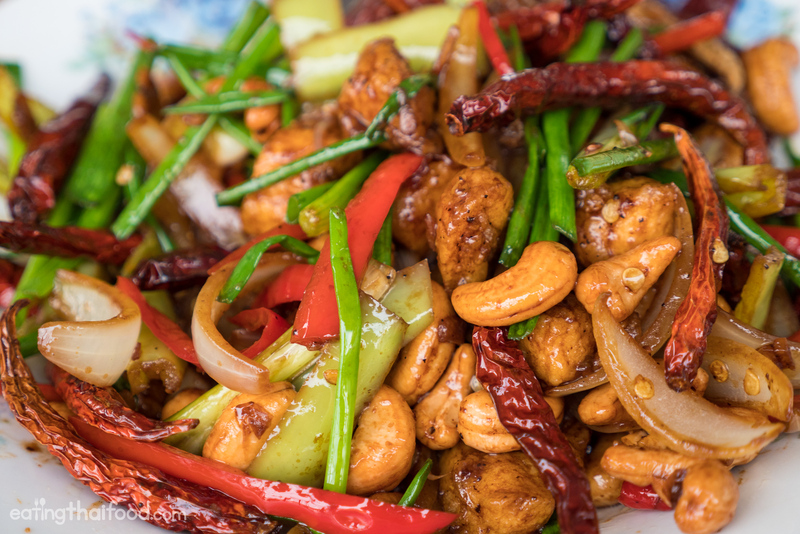 This thai style cashew nut chicken is really good! love it. Came here for the thai basil chicken recipe, that turned out amazing, so I started browsing for more recipes! This one also turned out so so good! Although, I couldn’t find all of the ingredients. Here are my changes in case anyone runs into the same problem: Use a little less than 2 lbs of chicken breast, sliced into small pieces. 5x all of the sauce ingredients. One thai pepper and one serrano pepper (no other peppers were used for spice) Added a red bell pepper and a head of broccoli. So, obviously, my recipe is not “authentic” because it does not follow your recipe exactly, but it’s still so yummy to me! Thanks again for a great recipe! Hi, I agree with your “quick note on cashew chicken” about it being “hit and miss” in Thailand. It’s probably my favourite Thai dish and I order it often ( with fingers crossed ) and yes, sometimes it just ain’t the same! I make a mental note of which outlets do it the way I like and return to them when I’m in the area. Sometimes too, they make it a bit too oily which turns me off. I gotta eat it with heaps of Prik Nam Pra with garlic slivers and I try to eat at least one of the Prik Thawt as long as I have a can of Singh / water nearby! This is really good. i think i tried this before, but is the thailand 7-eleven store version. Would share my wife this and hope she will cook it for me :) Thanks friend for sharing this! This sounds so yummy! And super easy to make. I can’t wait to try it! I recently made Tom Kha Gai, and I’ve always wanted to make this as a side dish, gonna try it this weekend. Thanks! It looks awesome. Definitely I am going to make it. Omg,I finally made and it was so good.Thank you so much for sharing this recipe.I can’t wait to see your next video! Yummmmm. Smack!! Burp!! Says it all. Oh my jungle hat. What an awesomely scrumptious delicious (mouth watering) dish. Mark, thanks once again for a 7 out of 5 star dish. A definite winner. Excellent recipe, have some friends coming round this Friday night and have been looking for some inspiration, I think I just found it. Thanks Mark. Tried it with a North Eastern twist and it was interesting. Also thanks for the many tips . Some have been very, very useful. Hope Ying, Micah, you and all your families are safe, well and happy. Keep up the good work Mark and many thanks cant wait for more. Mark, thanks a lot for all your shared recipes. I cooked a Thai Cashew Chicken on Sunday and it was really amazing. I made this recipe with ingredients available in Canada so had to substitute jalepeños for the banana chilis, but this is the best Thai dish I’ve eaten outside of Thailand! It took considerably longer than 30 min on electric stove, but worth every moment !!! Absolutely nailed this recipe with a little extra vegies in it. The taste was delicious and it is so easy to follow. Thank you. Yeah. I added a lot of bell pepper, onions and green onions to it and it was simply amazing ! A double recipe is perfect for 2 with 2 lunch for tomorrow ????. Wow that recipe was terrific it’s going into the rotation, made a few adjustments for Japanese ingredients and it was close to perfect. Thanks! Hi Mark, Thanks for the inspiration and the helpful additional information. I cooked it and it is wow. Only the Pad Kra Pao Gai (Thai Basil Chicken) is even better but you need variety. I had difficulties getting the dried chilies crispy, but I keep practicing. I’ll send you a picture of my result. Je vais faire cette appétissante recette et te donnerai mon appréciation, merci pour toutes tes recettes j’adore les choses authentiques . Hi Mark, Looks very good. Will try this recipe and will let you know. Thank you. Oh my Mark! This has to be the finest Thai Cashew Chicken I have ever tried! And I made it! I didn’t have any banana peppers so just used jalapeños and whatever else I had! A little prep but goes together fast! I assumed it was going to be super spicy, but that was not the case! Just perfect in every way! I’m buying the book! Thanks for sharing! When I got this recipe from you, I decided to cook it and I add just a little more chilli. Like you, I just love chilli. I completely forgotten to take photo of it. My partner and I totally love it. Hope you, Yin and Micah are well. When I got this recipe from you, I decided to cook it and I add just a little more chilli. Like you, I just love chilli. I completely forgotten to take photo of it. My partner and I totally love it. We also want to know how is Micah? Haven’t seen much of him in your video. Hope you, Yin and Micah are well. Made this last night for dinner, was AMAZING! ???? Hey Eric, ahaha, very cool, thanks for sharing your experience and glad this dish turned out so well for you and your family, and for sharing your extra tips! Thanks for the recipe, it looks tasty! I love the clarity of the photo’s, too. Looking at the recipe, with three types of chile listed, I thought “yeah, a fat lot of good these names are to someone in Lithuania, for example (it’s where I live), where you’re lucky to get a choice of red or green. It gives me a chance to decide whether each type’s been added for heat, flavour or bulk (as a vegetable). I know from my visits to Thailand that the heat is down to choice (local or tourist), but the photo’s help a lot for getting the style of the dish right. I’m looking forward to my wife going away for a couple of days, so I can FIRE up my wok! Hey Neil, awesome to hear that. 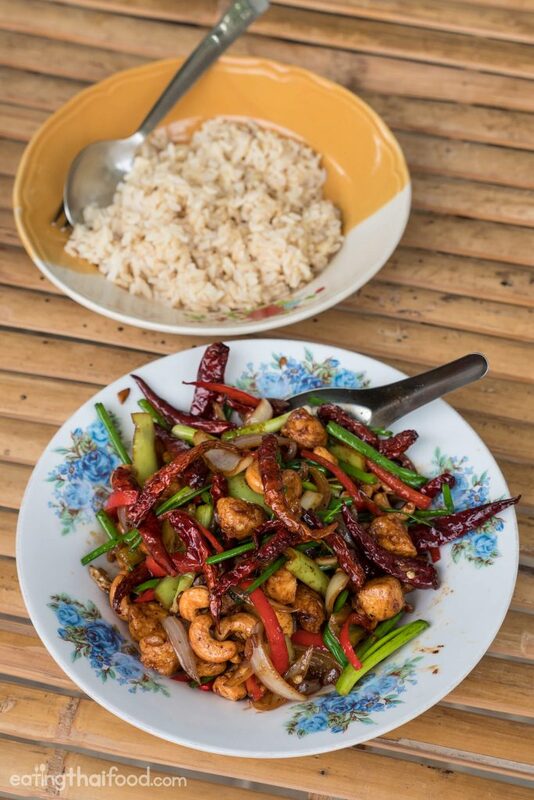 The red and green fresh chilies in this recipe are usually not very spicy, but mainly the dry red Thai birds eye chilies is where the main heat comes from. Hope you can get all the ingredients and try this out! Thank you very much Daniel, say hello to Grace as well! Great to hear that Linda, thanks and glad you enjoyed it! Simply delicious! I had my own dried chillies that I fried. Less meat and more onion as I’m reducing my meat. I put some aside for my lunch tomorrow, but it may yet be eaten! Thank you Tracy, glad it turned out so well! Thanks Mark, looks delicious, can’t wait to make it. Thank you Leena, glad you enjoy cashew nut chicken as well! Thank you very much Katrina, thank to Hanuman for this one! Hi Mark, as usual you’ve done a great job again. Its absolutely details and excellent recipe and dish. Thank you so much. Very cool to hear that Alistair, glad it turned out so well! This is a delicious dish for every occasion anywhere. Surely would enjoy it if I am not a vegetarian now for many years. Thank you very much Ed. I think you could probably make a really good vegetarian version of this with more vegetables or tofu, could be really good. Looks great Mark & is now on the menu for this week, although husband Ian is gasping at the thought of lots of chilli! 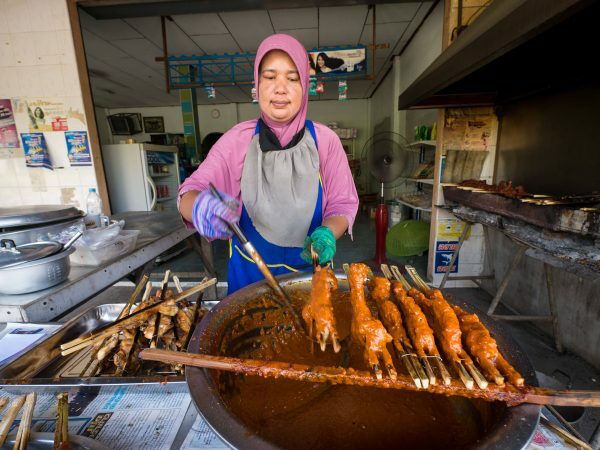 What on earth does the Thai government think it’s doing banning street food in Bangkok? All those street hawkers without work & diners going hungry. Bangkok IS street food! Can’t believe the govt could be so shortsighted. Hope you & yours are doing well. We love getting your updates & recipes…….I always watch your videos which make me want to be back in Thailand! Cheers & keep up the great work. Thank you very much Kathy. I think the latest news is that they won’t be banning street food, but rather adding a few more regulations. Thank you for your support! You are truly I love with that food as am I. Continue your excellent resurch and blogs. Thank you very much Mark. Hey Asoka, great to hear from you, thank you very much. Hope you can try this recipe out soon. Is there a Youtube video to complete it? Let’s say: As icing on the cake? Hey Roland, I didn’t have a chance to film a video for this yet, but maybe I can in the future. 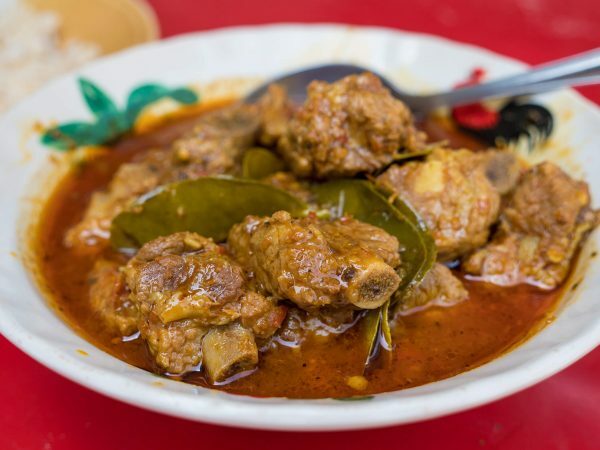 Hi Mark – this dish looks amazing and can’t wait to try it out. thank you. Thank you Susan. I think it would be totally fine to reduce the amount of chilies. Enjoy! Thanks Mark, looks fabulous, cannot wait to try my hand at it. I too love this dish and I have chef make it for me everyone we are in Bangkok. Great to hear that Carina! Mark the cashew chicken recipe sounds delish. I just went to Katz’s Deli in NYC. It was great!! Thank you Philip, awesome to hear that, that’s an amazing sandwich! Hi Michael and Ellinor, great to hear from you, very cool story, thanks for sharing, those are the types of food memories we remember forever! Thank you very much Ian. My guess is because this has Chinese influence, that’s why it’s salt and soy sauce. But I think fish sauce could work well also. Thanks!